A great portrait is said to reveal its sitter’s soul, and there is no soul one can know more intimately than one’s own. A self-portrait is virtually the antithesis of a conventional portrait: with most sitters, the physical features are immediately apparent and it is the personality which the artist attempts to descry; in a self-portrait, conversely, the mind is familiar terrain and the topography of the face is comparatively unknown. With the exception of conceited fops whose eyes are entranced by the mirror, the face is principally looked through, rather than looked at. There are earlier examples – a Fifth Dynasty Egyptian relief here, a Medieval monk’s doodle there – but the birth of the self-portrait is generally dated to the Renaissance. This can be attributed to two factors: the availability of state-of-the-art Venetian looking-glasses, and an increased awareness of the concept of the individual. However aware they were of themselves as individuals, though, many Masters chose to secrete a self-portrait in a group scene. 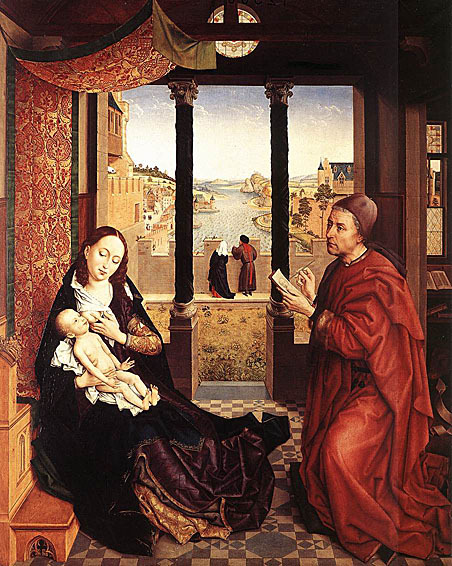 Among northern Europeans, the fashion was to represent themselves as Saint Luke, the evangelist traditionally held to have painted the Madonna’s portrait. Veronese crops up playing the viol at Cana; Raphael ratiocinates alongside Aristotle, Euclid et al in The School of Athens. And only a few papal footsteps away from Raphael’s fresco is one of the strangest examples of this type of embedded self-portrait. 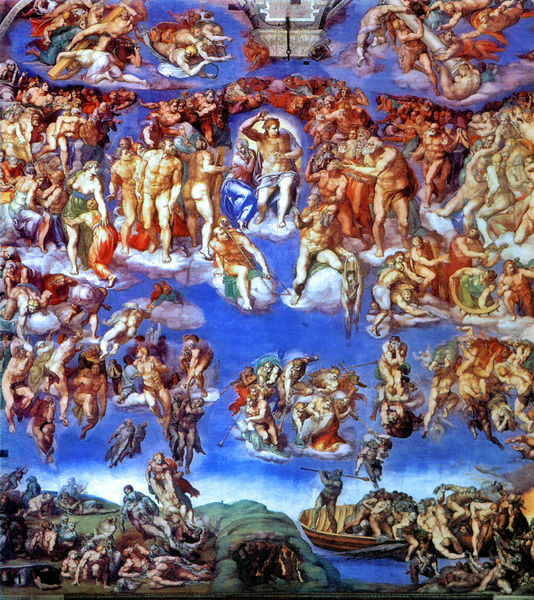 In The Last Judgement, on the Sistine Chapel wall, Michelangelo caricatures his own features in the flaccid, flayed skin of Saint Bartholomew, the apostle who was peeled alive by the kind of Assyria. He hangs limply from the flayer’s hand like some kind of hunchbacked balloon. 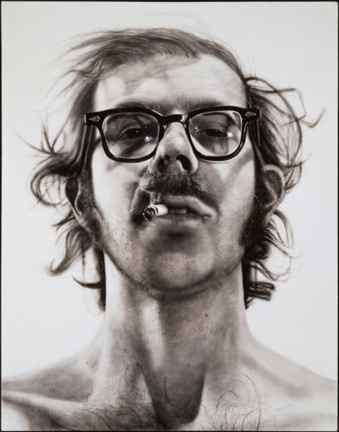 Self-portraits are commonly held to be a proclamation to the world – this is how I want you o see me, they say, whether flatteringly dashing or harsh and self-critical (Chuck Close’s immense acrylics prove he is no oil painting). In many instances, notably those pictures which contain such props as palettes and easels, there is a tangible sense of the sitter peering through the canvas at his own features. Certainly, in the 100-odd studies of himself that Rembrandt produced, one is conscious of the artist scrutinising his physiognomy, and his fascination with the effects of time on his face. Yet his often outlandish apparel and the variety of expressions he adopts indicate that, in common with many artists of his day, Rembrandt is often using himself as a particularly cheap, perennially available model. 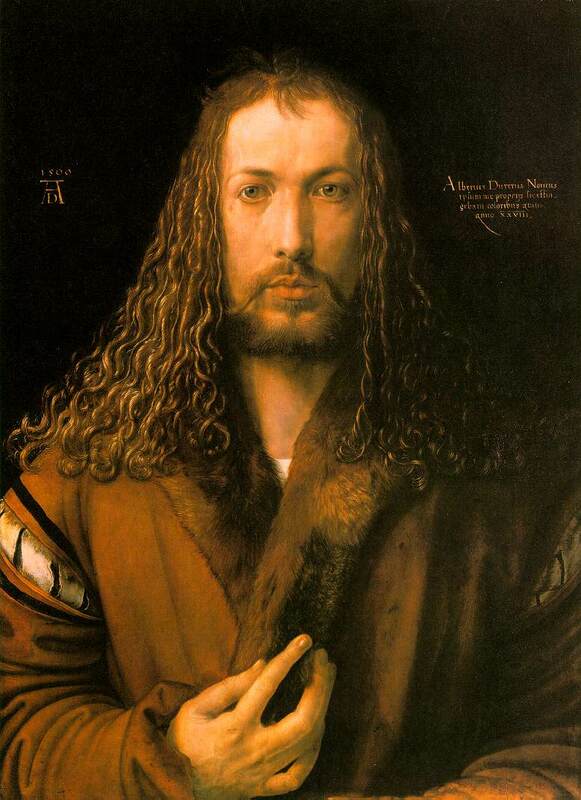 Dürer’s messianic self-portraits, similarly, can be read as studies for his naturalistic depiction of biblical scenes; they are also works of supreme arrogance. Dürer’s self-apotheosis demonstrates that the artist sitting for himself is rather like an actor-director casting himself in all the plum roles. For example, during Caravaggio’s years of riotous debauchery in Rome, the artist painted himself as Bacchus; after fleeing the city, having committed a murder, he put his own villainous features on the decapitated Goliath’s head. The role-playing element of self-portraiture has resurfaced in these postmodern days of performance and conceptual art. Such pieces are often charged with a spirit of dressing-up-box vanity, as with Gavin Turk’s iconoclastic waxwork of himself as Sid Vicious in the pose of Warhol’s Double Elvis. The images of Cindy Sherman and Gilbert and George are integral to their work – more than merely acting as models for themselves, they use their bodies as an artist’s material. And that Tony Hancock of the avant-garde, Marc Quinn, gave considerably more than an armful of his own blood to create the notorious Self – a bust in which both the subject and sole medium are the artist himself. These works combine the notions of the artist as celebrity and commodity. In 1937, the German Ludwig Goldscheider collated 500 self-portraits in a book with the imaginative title 500 Self-Portraits. A sequel of sorts has recently been published (with the added bonus of a reflective cover, for budding Narcissi to create an ever-changing 501st self-portrait), and a comparison of the two is instructive. The largely monochrome 1930s volume has a disproportionate number of Goldscheider’s fellow-countrymen; the new, full-colour book has a liberal smattering of women artists, and recognises photography as a valid medium. In Goldscheider’s day, the contemporary move towards abstraction might have seemed to signal the end of self-portraits; but the most intimate form of portraiture has proved more resilient than that. First published in World of Interiors issue 222. Reproduced with permission.